Mermaids. They are my absolute favourite, plus all those pastels and long wavy hair is perfect for SS14 considering as the beauty trends are one lip colours and braids. It just reminds me of modern mermaids. 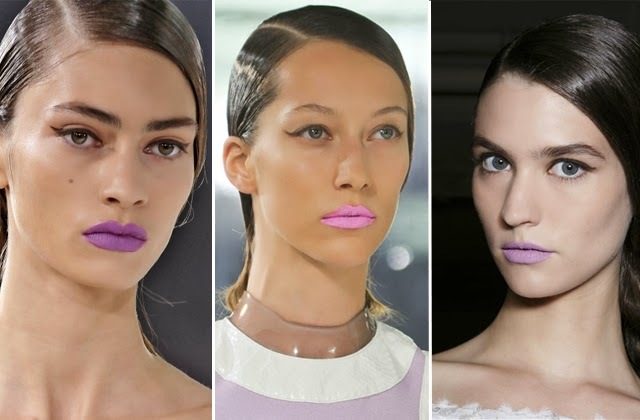 Plus, I've sightly already crawled into the mermaid trend as I dyed my hair blueish green this year, but I want to try different shades of lipstick like more 'lilac' and 'orange', but I just need to find the perfect orange since I'm already in love with purple lipsticks. The next trend I really want to try is being able to pull off that sporty look like Bella Mcfadden, one of my favourite style icons from the famous Instagram. Bella and her boyfriend always wear adidas together, which is so adorable; but how do you pull of a sporty look in a fashionable way. I maybe need to take advice from Alexander Wang and pair it up with light nudes. Also, dark colours are going to be my favourite this year. Especially black, everything goes with black. What trends do you want to try this SS14?